I've been in such a funk with my work wear lately, I feel like I need a total revamp of that side of my wardrobe. Of course, this isn't going to happen but I have decided to start finding ways to incorporate my casual wear into my business looks. This striped sweater is cropped quite short when worn on it's own (definitely not work appropriate) but when worn with a silk button-up underneath, it is suddenly acceptable. I really like the end result. so now I'm feeling much more inspired! 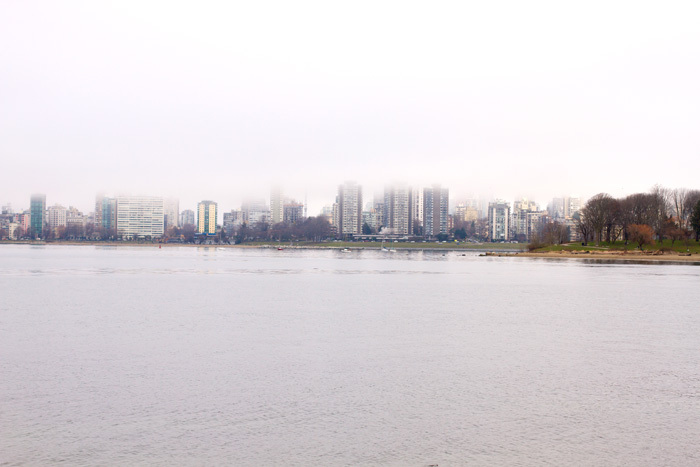 You might notice that the background in these photos look quite foggy and gloomy and that is because Vancouver has been covered in a blanket of fog for the last few days. We thought it looked quite interesting how the city is half covered across the water, but it sure was cold! gorgeous! !such an incredible and smart outfit!love your sweater and your shoes, honey!! Love the layers, this is a perfect work look! So pretty! Love how the cropped sweater looks over the blouse. totally loving the look girl the jacket is really nice! great business outfit! Love your shoes! I own that exact sweater. Love it. Digging the black and white ensemble with the pop of burgundy to spice it up. Work appropriate and chic. This is such a stunning work outfit! The pop of color from your heels is perfection. When I used to work in a formal enviorement I also incorporate casual items to my business look. You look proffesional. I also need to look more professional but at least now Im not wearing jeans everyday lol. you are so gorgeous- are you a model? :P Love the stripes! Great work outfit! :) Love the layer of sweater and shirt! And those shoes are really perfect! This is such a fabulous look! I love that blazer - and the stripes are perfect! So chic! Nice job with the layering! Very nice outfit. I like your shoes and bag. Great day. I love the layers! Sometimes we all get in a funk with our stuff. We just get used to the same things and sometimes it's hard to think outside the box. I'm trying to do that more often so I won't go shopping. layering is always a good choice. the re-invention of the wardrobe is always hard but advantageous. This is fabulous! The stripes layered in the middle really make a difference! And I adore your shoes! Hope it gets warmer for you soon! Those shoes are beyond!!! You look stunning! Thanks for sharing such a nice post! Also a very large 'thank you' for taking the time to leave a comment for me! e! That sweater is sooo beautiful! looks great with the shirt and the blazer!